Trying to pick the most disappointing team in Blues history is like trying to pick the most disappointing item on the Arby's menu. No matter what you pick, you're likely to end up in the fetal position covered in your own vomit when its over. The team that most left Blues fans with that empty feeling in their collective stomach has to be the President's Trophy winning 1999-2000 entry. Led up front by Pierre Turgeon and Pavol Demitra, and anchored on the back end by Hall of Famer Al MacInnis and Chris Pronger in his Hart Trophy season, this team rolled through the regular season and looked poised to make a deep playoff run. And that they did. This is where I should point out that for Blues fans, seven games in the playoffs is fairly deep. The question about this team was always how goaltending would hold up under playoff pressure. Unfortunately, this is how Roman Turek answered that question in the deciding game in their opening round matchup with the Sharks. Unfortunately that won’t be the last 60-plus foot slapper on this list. Brace yourself Blues fans. Many superstar players have donned the Blue note for a brief period, but few outside of Gretzky have come with the hope and fanfare that came along with Miller. Fourteen years after Turek laid an egg against the Sharks, the Blues once again found themselves with a great regular season goaltender that they didn’t quite trust when it really counted in Jaroslav Halak. Halak had actually only made two playoff starts in his four years with the team due to poorly timed injuries. Miller to the Blues had been rumored for months, if not years, so when he finally arrived prior to the deadline this year, fans were over the moon. Unfortunately that appeared to be where Miller left his game en route from Buffalo. Miller's save percentage dipped from .923 with Buffalo to .903 the remainder of the regular season with the Blues, to .897 in the playoffs, where sights such as this were not uncommon. You almost have to wonder what that Halak guy could’ve done in the playoffs if given the chance. This offseason Miller moved on to Vancouver, where things always work out for slick haired, beady eyed goalies. Most Disappointing Moment in Blues History: Yzerman. The second most disappointing part of this clip is that it appears the two idiot fans that wave to the camera like idiots at the :03 second mark appear to turn around in time to see the goal. For the record, I am in the minority of Blues fans that give Gretzky a pass for the turnover on this play. For one, he led the team in scoring with 16 points in 13 games, and had suffered a concussion in his second game with the team. Think the image of the game's best player being carried off the ice by teammates days after a blockbuster trade would be a bigger deal in 2014? A dishonorable mention goes to the 1983 draft. In the summer of 1983, the Blues ownership was…less than ideal. Irate that the NHL had blocked its sale of the team to a group that wished to move the Blues to Saskatoon, Ralston Purina, the owners at the time, refused to operate the team after the conclusion of the 1983 playoffs. This included the '83 draft. The Blues did not send a representative, and made no selections. The fourth pick in the draft that year? Stevens signed as an RFA with the Blues in the summer of 1990. He was immediately named team captain and led the team to one of their most exciting seasons ever before being a disappointing playoff exit to Minnesota. Sounds like a good enough deal right? Time for the fine print. First of all, the Blues ended up having to fork over FIVE first round draft picks to the Caps as compensation for signing Stevens. Secondly, losing 5 first rounders wasn’t enough to deter GM Ron Caron from signing high end RFAs. A year after signing Stevens, Caron signed RFA Brendan Shanahan from New Jersey. This would end up being Craig Janney's least favorite transaction, but I digress. The Blues original compensatory offer to New Jersey centered around Curtis Joseph, but wasn’t enough for Lou Lamoriello. In the end, an arbitrator awarded Stevens to New Jersey bringing the Stevens era in St. Louis to a close after just one season. Offer sheets used to be a lot more exciting. This guy just couldn't help himself. As if trading away fan favorites like Curtis Joseph and Brendan Shanahan, he teased fans by bringing in Wayne Gretzky only to alienate him in the playoffs, driving him to the Rangers in free agency. He also tinkered with the roster constantly, as the 95-96 roster highlights - 46 PLAYERS! Overall, he made 24 trades in his two years as Coach and GM, and countless more singings, call ups and demotions. He was eventually fired after a summer which saw Keenan bungle Brett Hull’s contract negotiations, and a poor start to the 1996-97 season. 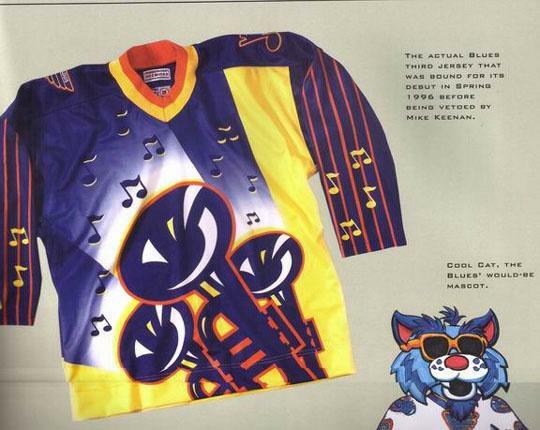 Most Disappointing Blues Fashion Choice: This thing. At least Keenan got something right.